As I think back on a couple friday's ago, on September 29th to be exact, I still find myself in this whimsical, dreamy daze. 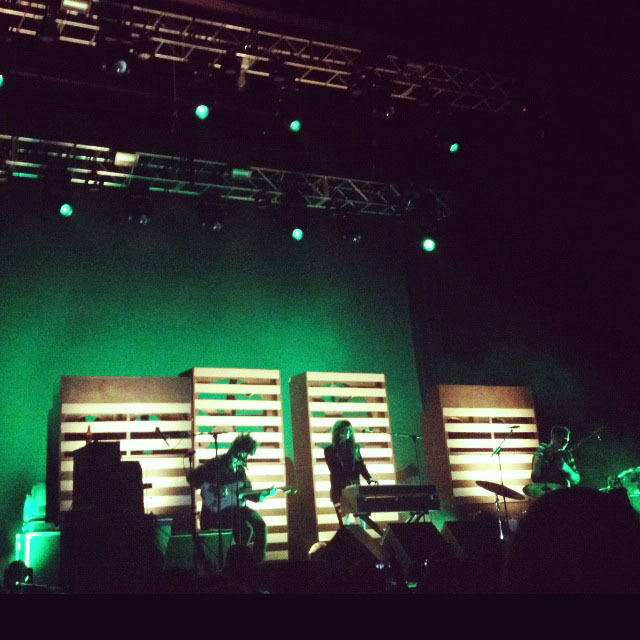 Baltimore, Maryland natives Beach House, consisting of the adorable duo that is Victoria Legrand (on vocals and the organ) and Alex Scally (on guitar and keyboard), performed at the Fox Theatre in Oakland last Friday. Touring musician Daniel Franz also accompanied the duo on drums and percussion. The Fox Theatre was an impeccable venue for the show, as the interior design of the venue completely mirrored the aura of the dreamy pop duo. With vibrant colors, stunning gold accents, and highly ornamented walls and ceilings, the theatre felt like something out of one of the most mystical of dreams. Beach House released their latest album entitled Bloom earlier this year in the month of May on the Sub Pop label, which is home to a variety of alternative and indie rock artists such as The Shins, Dinosaur Jr., Fleet Foxes, and No Age. The ethereal trio played a sold out show to an audience that was nothing short of enchanted. The stage was embellished with four windmills housed behind enormous rectangular boxes, with slit openings. The lights were marvelous; shining through the slits of the boxes and turned the theatre into the most intimate of settings. The visuals of the show added to the reverie, with cryptic video clips displayed on the screens during songs like “Used to Be” and “The Hours,” as well as a dazzling display of sparkling starlight as the backdrop. Everyone was entranced. 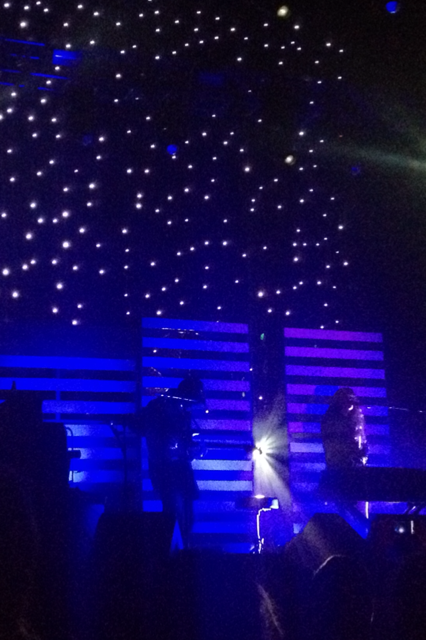 Ravishing and heartstrings tugging expert Victoria Legrand was the queen of the night, with her vocals resembling a cross breed between a sorceress and something incredibly celestial. She was completely out of this world. Scally and Franz kept the dream moving along as they strummed and pounded away on their instruments to the sound of Legrand’s haunting voice. They started off the show with the second track off of their newest album Bloom, entitled ‘Wild’. When I closed my eyes as the song played, I felt myself diving into the deepest of oceans as Alex Scally’s guitar guided me through this fantastic adventure. Legrand’s voice was both incredibly euphoric but at the same time, sufficiently melancholic. They continued on to play the entire Bloom album, as well as sufficiently covering tracks from their older albums Teen Dream (2010) with songs “Silver Soul”, “Zebra” and “10 Mile Stereo” (along with a few others), Devotion (2008) with songs “Gila” and “Heart of Chambers,” and even from their debut release Beach House (2006) with “Auburn and Ivory” and “Master of None”. They had mentioned that they hadn’t played “Auburn and Ivory” in four years, so it was definitely a treat for all attendees as well as the band themselves. They closed out the show with an encore consisting of three songs, “Turtle Island/Nothing”, “Myth” and the 17-minute song “Irene”. They closed out the show with Legrand’s Stevie-Nicks like hair swaying vigorously as she pounded the keys to “Irene” with the audience left with huge smiles on their faces and seemingly interminable goose bumps.